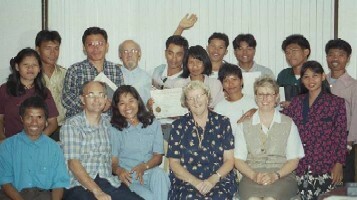 Despite warnings from the U.S. State Department and the British Consular Office, a Young Ministry Group Team led by Julie Young arrived in General Santos City in the Philippines on Sept. 7th, 2001. 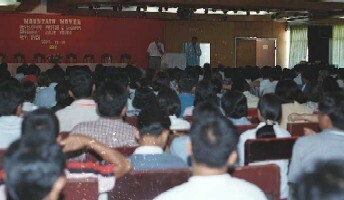 The YMG Team had come to hold Conferences and a Healing Campaign in the city. Rebel Islamic groups, notably the Abu Sayyaf, were operating locally. Julie's team was composed of one American, four British nationals and one French national. The team was overseas during the time of the terrorist attacks on the United States and became possible targets for attack while doing high-profile meetings in the Philippines. However, despite the risks and danger (police and other government agency personnel were assigned to protect Julie and the team) it was clear that the time was correct for the mission to take place. In the increasingly tense situation the team witnessed the Lord's miraculous work and His protection. 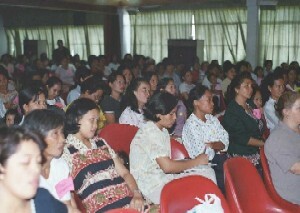 The first week of the mission was divided between a Women's Conference, a Pastor's Conference, and work in the schools and churches. 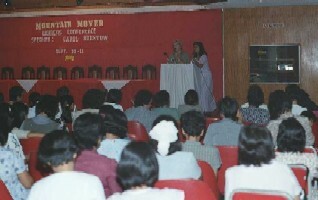 Nearly 300 women packed the rooms each day during sessions led by Rev. Carol Burstow of the U.K. The meetings were characterized by great spiritual hunger and God's hand of power on individuals. The participants came from many denominations and were exposed to the movement and teaching on the Holy Spirit, culminating in 100 women receiving prayer for the baptism in the Holy Spirit. Many women stood to declare themselves to become witnesses for Christ in their community. A great rush of the Spirit moved with intensity over the women as they were crying out to God; many fell under the power, and many were healed. The Mountain Movers Pastor's Conference welcomed more than 260 leaders and pastors to three days of teaching and directed preaching. Experienced pastor and teacher from Great Britain, Rev. Keith Dyer taught in the main sessions. Julie preached the evening meetings. God powerfully moved to challenge, restore, and empower ministers. Julie preached repentance and commitment on the closing night of the conference. There was great conviction and searching of heart as church leaders knelt before the Lord. One observer noticed small pools of water on the floor where people had been praying and weeping. The presence of God was strong, and some church groups that had been in conflict began to reconcile. There was restoration and healing as the power of the Lord moved on the ministers. A crowning moment came on Saturday following the conference. Twenty-five New Life Christian Fellowship ministers from the mountains were ordained in a service conducted by Julie (NLCF Missions Representative) and Doyle and Merlyn Head (resident NLCF missionaries). It was a service of intense power as these pastors and preachers consecrated themselves to the Lord's service; every minister received prophetic words during prayer and fell under the power of the Holy Spirit.